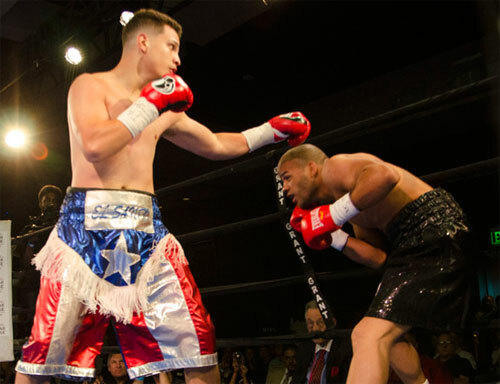 Hard Hitting Promotions brought the very first boxing show to the Sugar House, after the Philadelphia casino's nearly six years of existence. And Friday night's event was an all-around success, with a standing room only crowd and a slate of ten strong professional bouts. 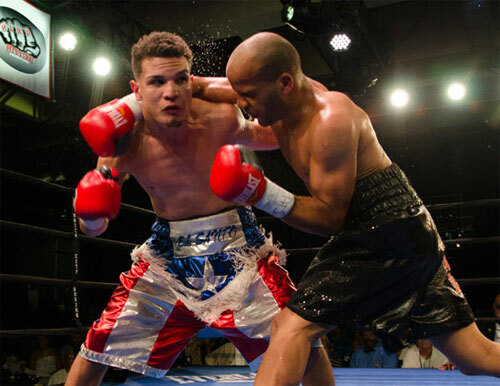 In the main event, Philadelphia junior welterweight Milton Santiago, 15-0, 3 KOs, defeated Ken Alvarez of Puerto Rico, 7-5-2, 3 KOs, by 8-round unanimous decision. The victory was just Santiago's second of 2016, but he hit the milestone of fifteen straight wins in his young pro career. Santiago looked strong, sweeping all eight rounds on my scorecard. A few of the rounds were close, but Milton did enough to take each frame, with his busier work rate and cleaner punches. Alvarez was aggressive throughout the bout, and probably had his best round in the fourth, when he landed many blows against the hot prospect. In round six, Santiago hurt Alvarez with a right, trapping him in a neutral corner where he fired away at the wounded Puerto Rican. Santiago landed flush over and over, but Alvarez remained on his feet. Santiago closed the show with a pair of hard rights, but suffered a cut over his right eye. The blood streamed until the final bell, but the outcome of the fight was never in doubt. Although my score was a shutout, the official judges saw the fight a bit closer. Adam Friscia scored the bout 79-73, while Alan Rubenstein and Lindsey Page turned in 78-74 scores. 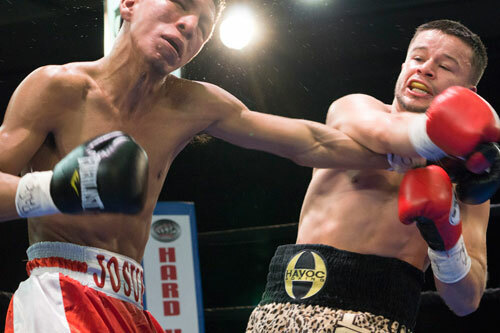 The win kept Santiago climbing toward a bigger fight and a national ranking in the 140 pound division. Still just 19 years old, and a pro for only a little over two years, Milton probably has another year or so before we see him in a critical fight. However, all the early signs of success are obvious in Santiago. 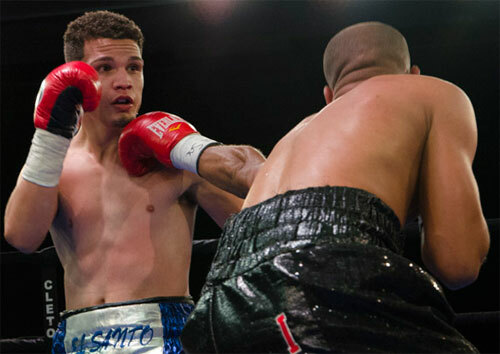 In the 6-round co-feature, Puerto Rican featherweight Luis Lebron, 7-0, 3 KOs, settled for a split decision draw against Tyrone Luckey of New Jersey, 8-7-2, 6 KOs. The fight was a close and steady battle with Lebron slightly more accurate and busy, but Luckey stayed in there and landed plenty of his own punches. There were no knockdowns and most of the rounds were closely contested. After the full six rounds, the scores were all over the place: 59-55 for Lebron, 60-54 for Luckey and 57-57 even. I scored the fight for Lebron by a wide margin. 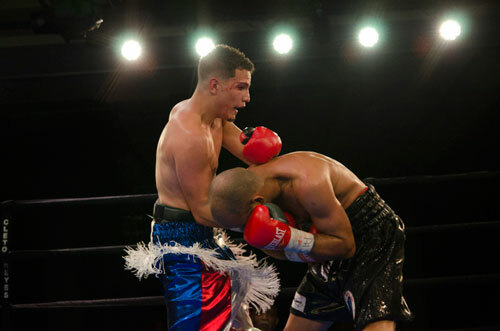 South Philly native Christian Carto, 3-0, 3 KOs, continued his impressive rookie season with an easy TKO of Jonathan Hernandez, of Puerto Rico, 0-3. 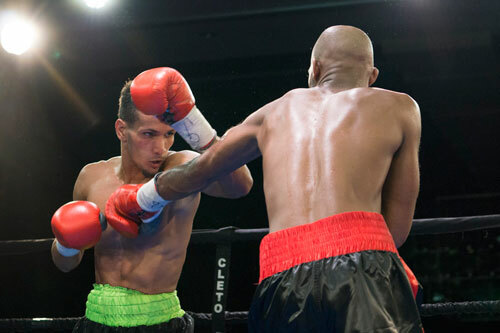 The bantamweight overpowered Hernandez and stopped him at 1:02 of round two of a scheduled 4-rounder. Carto landed some big shots in the first round, but Hernandez survived he onslaught. However in round two, Carto stepped on the gas and ran over his helpless opponent. Christian pounded Hernandez into a corner and hurt him with a volley. Hernandez wobbled and lurched into the corner, forcing referee Shawn Clark to step in to stop the fight. The end came at 1:02 of the second round. It was another show-stealing performance by Carto. 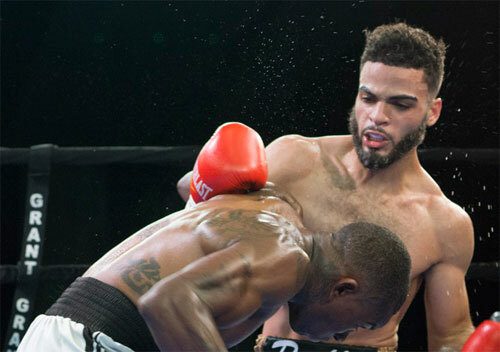 In another scheduled 4-rounder, light heavyweight David Murray, 5-1, 4 KOs, Wilmington, scored a first round TKO of Philadelphian Maurice Amaro, 2-10-1, 1 KO. Murray dropped Amaro mid-way through the round and finished him moments later. The knockdown came suddenly, although the writing was on the wall early on. Still, when Murray landed the right hand that put Amaro down, it was a shocking blow. Amaro staggered to the floor and Murray almost fell to the canvas in all the commotion. When Amaro got up, Murray leapt right on him and referee Blair Talmadge halted the fight. The time was 2:35 of the first round. Featherweight Ricky Lopez, 17-4, 6 KOs, Colorado Springs, won a 6-round unanimous decision over Nicaraguan Josue Bendana, 10-7-4, 6 KOs. The best round came in the third when the fighter traded throughout the round. Bendana took the round on my card, but it was the end of his two-round rally. 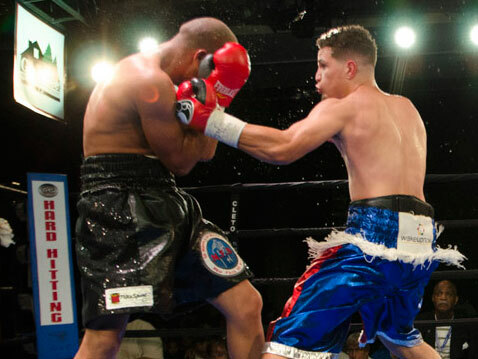 Lopez buckled down and swept the final three rounds to secure the decision. Lopez won all three official cards, 59-55 and 58-56 twice. My score was also 58-56 for Lopez. Philly junior featherweight Angel Pizarro, 1-0, made a successful pro debut by beating Newark, NJ southpaw Marquis Pierce, 1-10. 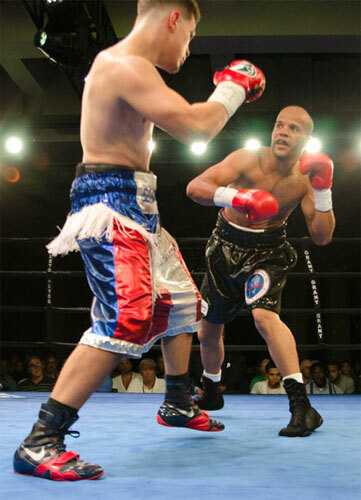 Pizarro wobbled his game opponent in rounds one and three, and swept the official cards by 40-36 shutout scores. I also scored the fight 40-36. 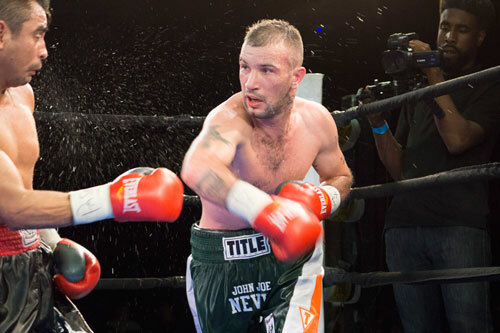 Lightweight John Joe Nevin, the 2012 Olympic Silver Medalist for Ireland, remained undefeated, 8-0, 4 KOs, with a 6-round unanimous decision over Floridian Jesus Lule, 8-19-1, 1 KO. Lule was the aggressor much of the way, but Nevin landed one jarring punch after another to win every round. All three official scores (by Lindsey Page, Alan Rubenstein and George Hill) were 40-36 for Nevin. My tally was also a shutout for the Philly-based Irishman. 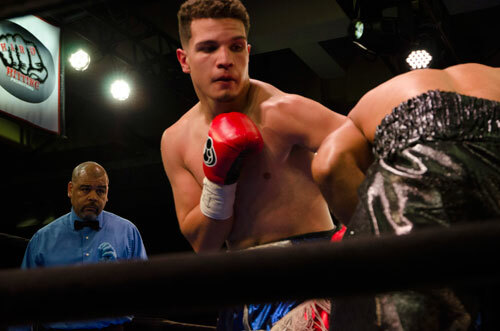 Edgar Cortes, 3-3, Vineland, NJ, upset Philly's Alex Barbosa, 5-3-1, 1 KO, by unanimous decision after four rounds in a battle of featherweight southpaws. Cortes had his best round in the second when he repeatedly landed his left uppercut on Barbosa. Alex fought back all night, but always seemed a step behind Cortes. In the end, all three judges (Page, Rubenstein and Friscia) had it 40-36 for Cortes. 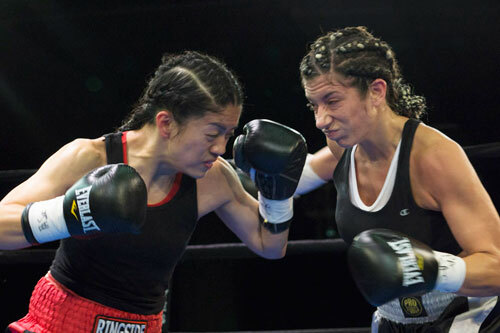 Female flyweight Laurie Schiavo won her professional debut, 1-0, against fellow-first timer, Mary O'Leary, 0-1, of Springfield, MA. After a quiet opening round, it was a scrappy battle with the second and the fourth rounds containing most of the action. 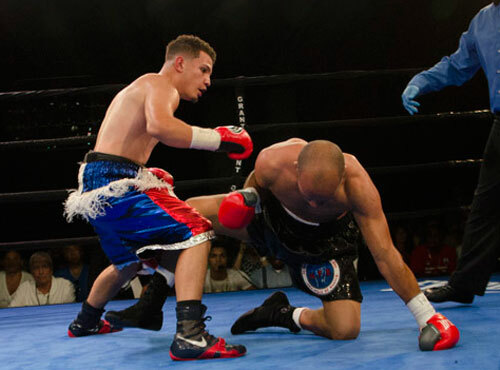 After four rounds, Schiavo took the split decision by scores of 40-36, 39-37 and 37-39. 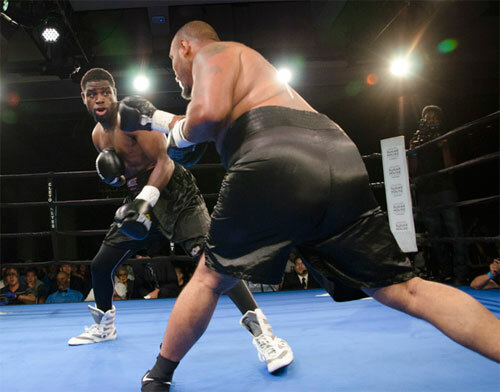 In the show-opener, heavyweight Lamont Capers, 7-8-2, Hawley, PA, won a 6-round unanimous decision over Philadelphian Pedro Martinez, 7-10, 3 KOs. Martinez used his career-high weight of 270 to bully Capers against the ropes. He took the second and fourth rounds on my card, but Capers outworked him the rest of the way. The three official scores were all 59-55 for Capers, while I had it a bit closer at 58-56. The show was a complete sellout of the 1,000 seats set up around the ring, and even managed to pack in another 300 or so fans, with standing room only tickets. The 1,300 attendance was one of the biggest for Philadelphia this year. Hard Hitting Promotions plans to return to the Sugar House for another pro boxing show in October.